make your favorite brownie batter. i like to use a variation of this recipe because it uses cocoa instead of baking chocolate (my variation only uses 3 eggs and 1 cup of flour, so they'll be chewy and moist rather than cakelike). but any recipe should work, as would a box brownie mix. put the muffin papers in the pan and drop a small amount of batter into each one—no more than 2/3 or so full. 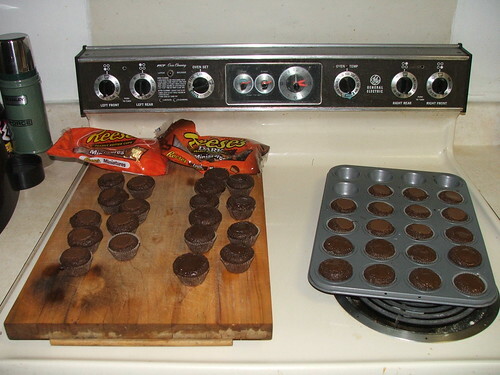 open the peanut butter cups and sink them into the batter. press them down so the batter comes at least most of the way to the top of the peanut butter cup. bake at the temperate directed, but take them out early because they will bake much faster than in a pan. i took mine out after 15 minutes (the brownies normally take 20-30) and even then my wife thought i should've taken them out earlier. You will get even better results with a silicone muffin pan. Sometimes you can find them at Tuesday Morning. yeah, probably the metal pan gets too hot or something. thanks for the tip, we'll look into it!